There are two species of hares in Alaska, the snowshoe hare and the Alaska hare. Snowshoe hares weigh three or four pounds and the Alaska hare is distinctly larger, at six to 12 pounds. Both are grayish-brown in summer, with white underparts, and turn white in the winter. This winter camouflage is caused by physiological changes triggered by the shortening day length in autumn. That means that in years when the snow is late, these white animals stand out markedly to predators and hunters. Hares are closely related to rabbits, but hares are born fully furred and with their eyes open and are able to hop around in just a day or two. Hares don’t use dens and burrows for shelter or to escape from predators. Rabbits are born hairless and blind, don’t open their eyes for a week or more, and use nests and burrows. The Alaska hare (Lepus othus) lives in western coastal Alaska and the Alaska Peninsula, and are often found in groups. They favor windswept, rocky slopes and upland tundra, and tend to avoid lowlands and wooded areas. They feed on willow shoots and green vegetation. The range of the Alaska hare seems to be diminishing. The snowshoe hare (lepus americanus) is also known as the varying hare, because of its seasonal color change. The distribution of the snowshoe hare is far more widespread than the Alaska hare, and these smaller hares are found throughout much of Interior Alaska. 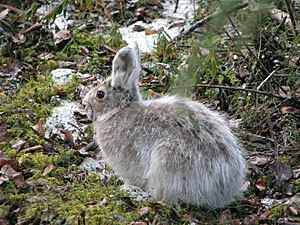 Snowshoe hares are present in Southeast Alaska, but not abundant. Decades ago, snowshoe hares were rare north of the Brooks range, but in recent years they have expanded their range into that area. Snowshoe hares are found in mixed spruce forests, wooded swamps, and brushy areas. They feed on grasses, twigs, willow and aspen buds and green leaves, and their browsing often leaves signs. Hares nip twigs and branches neatly at a 45 degree angle with their sharp incisors. In the winter, as snow allows them to reach the tender shoots higher up, hares may stand up and clip twigs three or four feet above the ground. Several hunters can work together to drive hares out of cover. The “watchers’ should be positioned where the “drivers” will push hares out of the cover into the open – at the end of a long row of alders, along streamside areas with thick willow or alder or where there’s cover next to open country. Tularemia is a bacterial disease that can be transmitted by hares to people and pets. It can cause wound infections, swollen lymph nodes, fever or flu-like symptoms. Though cases are sporadic, it does occur in humans, especially in Interior Alaska. The situation is very different for pets, however. Dogs and cats commonly acquire tularemia, typically after killing or consuming a sick hare. Cases are diagnosed every summer by veterinarians in Fairbanks and the surrounding area. It is easily treatable with antibiotics if detected early but is potentially fatal if not treated appropriately. Transmission to people usually results from gutting and skinning an infected hare but the ticks that are common on hares and rodents in Alaska can also transmit it. As a general precaution when handling hares, minimize contact with body fluids and the intermal organs (use protective gloves and wash well with antibacterial soap). Cooking will kill the bacteria.